Our program dogs are rescues from local animal shelters. Once a group of dogs is selected, we bring them into incarceration facilities where designated trainers care for the dogs 24 hours a day, seven days a week. Before teaming up with one of the dogs, program trainers first participate in four weeks of lecture classes. Then, over the next 8–10 weeks, they teach their canine students good manners and basic obedience. Upon successful completion, each dog is adopted into a loving home. During classes, some dogs exhibit special aptitude, and these canines receive advanced training afterwards in order to become working service dogs. We significantly impact local communities in a number of ways. Since its inception, Cell Dogs has successfully rescued, trained, and placed over 300 dogs into new homes. The program goes much further than simply reducing euthanasia rates and saving costs at local shelters: it transforms all program participants, providing them (and the dogs they train) with a valuable second chance at leading productive and responsible lives. Dog adoption is also made easier as people looking for a shelter pup are not always equipped to handle an untrained or unsocialized animal. Cell Dogs currently runs programs in two facilities and plans to expand to new institutions in the near future. Our partnering facilities are great advocates and champions of the program. 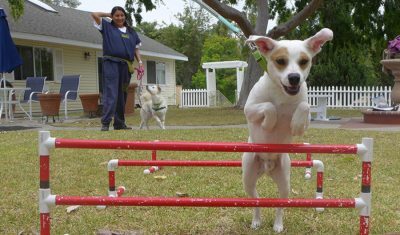 Cell Dogs at OC Probation, actively working since 2009, selects 25–30 juvenile wards each year for participation. The unit in which training takes place annually houses over 100 young men who, through the dogs, reap therapeutic and psychological benefits. Working with the dogs demands commitment, problem solving, and patience. Through these hands-on experiences, program trainers realize the rewards in working hard towards positive goals. California recidivism rates for juvenile offenders are upwards of 55% within the first year of release. Recent research by the University of California Irvine found the recidivism rate for our Cell Dogs program to be just 16%. Started in 2013, Cell Dogs at James A. Musick Facility designates about 20 men and 15 women as trainers annually. The men’s unit houses 200 people, and the women’s unit houses 50. The presence of the dogs helps everyone to (re)discover compassion as well as the benefits of demonstrating positive commitment. Program participants are given a new sense of purpose while learning healthy life skills. They also acquire marketable job talents: former program trainers have become professional dog groomers and trainers. The recidivism rate at this institution is over 70% for males and 47% for females. The rate for our male and female program participants is 14% and 11% respectively. We believe Cell Dogs is one important factor in keeping individuals from returning to an institutionalized life. During our training courses, some dogs prove to be quick studies in basic obedience. Expressing an eagerness to learn and do more, these canines are then given advanced training to become service dogs. The Americans with Disabilities Act states that “Service animals are defined as dogs that are individually trained to do work or perform tasks for an individual with disabilities. The task(s) performed by the dog must be directly related to the person’s disability.” Our scope at Cell Dogs includes: Autism Service Dogs, PTSD Service Dogs, and Wheelchair Service Dogs. This training program typically requires an additional six to nine months.